This is the view from Brasileiro and Brasileira's apartment. Pretty nice, huh? 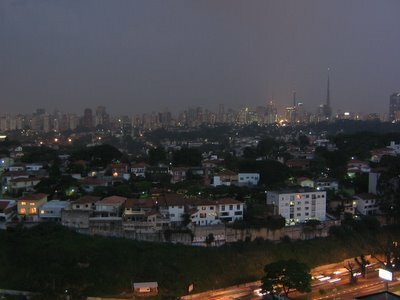 The bright lights near the middle of the picture on the left are the lights of this stadium, where Brasileiro's soccer team plays. If anyone watched the Amazing Race season opener this week, this was the pit stop. Corinthians is his team - I think they're kind of like the Yankees, you either love 'em or you hate 'em, but either way you're stuck with them because they win all the time. Brasileira is a fan of São Paulo, which plays in the stadium where we saw U2; the third team in São Paulo is Palmeiras. We went to a Corinthians game later in the week. During "Pride" Bono was trying to do this whole international yay, we love each other thing to get people to sing for all these different South American countries. But when he got to Chile, enthusiasm flagged a little, and when he got to Argentina, 70-some thousand angry Brazilians booed. He looked a little taken aback. But it's his fault - he's the one who kept bringing up the World Cup. Look, I brought it back to soccer! Wow. That was slick. I wasn't even heading there. Well, I think it's a sign that I should end this post here. Okay, when I went to the link there was an ad that was just a picture of some ginormous breasts. Brazil is living up to its stereotype! Actually, I preferred the Argentinian one because I can't read portuguese. Thanks for giving us a choice. Oh yeah, is that what it said? I can't really read Spanish *or* Portuguese. Oh, *everybody* knows Katilce is *totally* a ho - a fat, filthy, Bono-lovin' ho.